February 1960 saw rock ‘n’ roll come to the Grosvenor Ballroom on Saturday nights. Until then, Saturday evenings had featured dance bands. For the first three weeks Stanley Dale is shown as the promoter, but after this the adverts are under a heading of Eddie Friday presents – though it seems likely that Stanley Dale continued to be involved for some months. 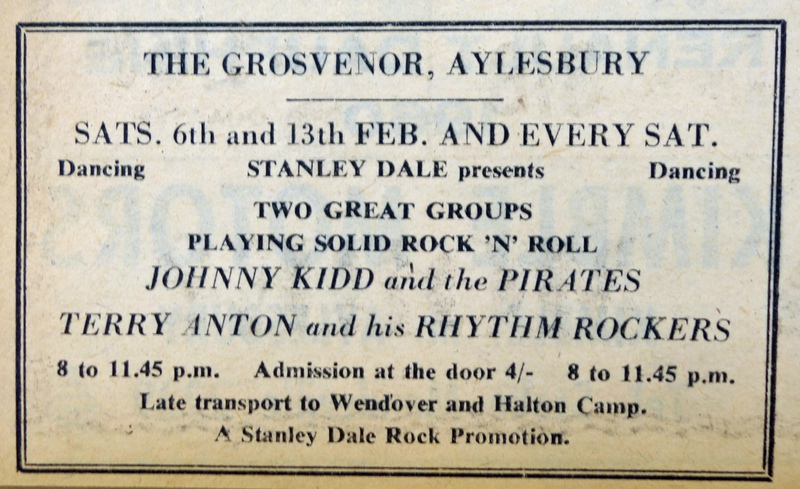 Stanley Dale managed Johnny Kidd and the Pirates through his company Associated London Scripts until January 1962 – the period in which Johnny Kidd and the Pirates made most of the Aylesbury appearances. Later, in October 1962, Stanley Dale made a bid to buy the Grosvenor Ballroom (see below). Playing that first night were Johnny Kidd and the Pirates and Terry Anton and his Rhythm Rockers. This same combination played for each of the next three weeks, and both went on to be regulars in Aylesbury. The Bucks Advertiser reported that the attendance was 560 for the opening night, and by the third week a “sell out” was reported. 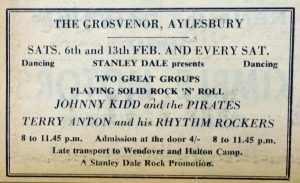 Johnny Kidd and the Pirates played 48 times in Aylesbury, including nine times at the Sunday Club that Eddie Friday started in May 1960. That month also saw Johnny Kidd and the Pirates in the studio recording “Shakin’ All Over” which took the band to No. 1 in the singles chart. Guitarist Alan Caddy and drummer Clem Cattini were later in the Tornados, after leaving the Pirates. Cattini went on to be a session drummer – and has played on 44 UK no. 1 singles. He also played on Lou Reed’s debut solo album which was recorded in London in 1971/1972 with London session musicians, including Rick Wakeman and Steve Howe. Another group making regular appearances was Mike West and the Silhouettes. Mike West had previously played with Johnny Kidd and the PIrates, but had left to form his own group, which included guitarist Tony Doherty who had also been a Pirate. Also appearing were Red-E-Lewis and the Redcaps who at some stage included Jimmy Page as guitarist. There is some confusion with the Red-E-Lewis band and Neil Christian and the Crusaders. I was touring with Johnny Kidd and the Pirates. We used to play this place in Aylesbury and Jimmy [Page] was in Neil Christian and the Crusaders, which was the support band. He was only fifteen and he was already a phenomenal player. I have found no record of Neil Christian and the Crusaders playing in Aylesbury. As Clem joined the Pirates in 1960 (source: Johnny Kidd and the Pirates website – Timeline), it may be that he is referring to Red-E-Lewis and the Recaps. 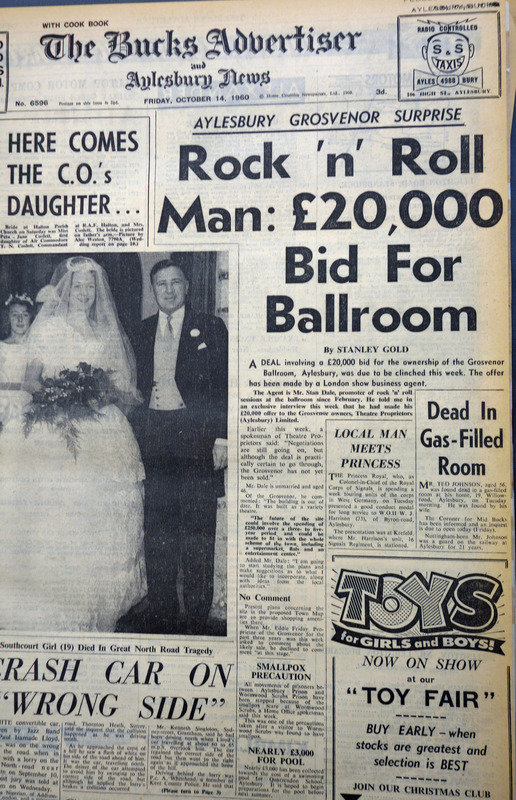 On October 14th, the Bucks Advertiser carried a front page story under the title “Aylesbury Grosvenor Surprise – Rock ‘n’ Roll Man: £20,000 Bid For Ballroom”. Although the article reported that the deal was due to be clinched that week, it did not go ahead. Click on image to enlarge. The following is a list of 1960 gigs at the Grosvenor. It is possible that there were some changes to the artists who actually appeared due to last minute cancellations, etc. ; details have been checked as far as possible, but if you have any corrections or additions please let us know! Looking at the list, it is obvious that there was a regular rotation of a relatively small number of groups during the year. Copyright © 2019 Stephen Daglish. All rights reserved.